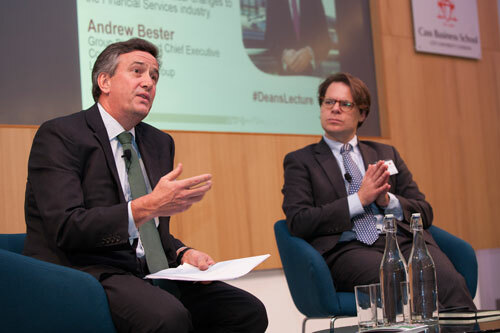 Values-based leadership was the topic under discussion at the Dean’s Lecture given by Andrew Bester, Group Director and Chief Executive of Lloyds Commercial Banking. Values-based leadership was the topic under discussion at the Dean’s Lecture given by Andrew Bester , Group Director and Chief Executive of Lloyds Commercial Banking. He talked about the lessons he had learned from the 2008 financial crisis and his 24 years working in financial services. Mr Bester said he was “humbled and privileged” to be speaking at Cass, and said he was offering a “practitioners view – I’m not here to offer scholarly insights”. He said: “I think that the UK system has made great progress in regulation [since 2008]. Financial innovation had become an end in itself. The risks that had been created had pretty much been missed by everyone. “I can honestly say that the ten weeks following the 2008 financial crisis was one of the most intense learning periods of my life. It made me understand how banking really works. “The core customer was being lost and the basic function of a bank was being lost. At the height of the pre-crisis: profit was king. “Now, the public has become cynical. Banks have become the face of societal malaise. In short: trust was lost. “How had products drifted so far away from what people wanted? Much went wrong. It had a big impact on the way we lead. It made me trust the values that I grew up with. Mr Bester went on to talk about values-based leadership and how all cultures and social groups are regarded consistently. “If you start with values and purpose, profits and results will follow,” he said.